The s.c injection of tumor Ag-derived, MHC class I-binding peptides together with cationic poly-amino acids (e.g., poly-l-arginine; pR) has been shown to protect animals against a challenge with tumor cells expressing the respective peptide(s). Given our only restricted knowledge about immunogenic tumor-associated peptides, we sought to determine whether this pR-based vaccination protocol would also induce protective cancer immunity if large proteins were used instead of peptide epitopes. We found that the intracutaneous administration of the model Ag β-galactosidase (β-gal) together with pR (referred to as pR-based protein vaccine; pR-PV) was significantly more potent in protecting mice against the growth of β-gal-expressing RENCA cells than the protein alone. Coadministration of pR enhanced both the β-gal-induced specific humoral and CD8 response. The protective effect required CD8+, but neither CD4+ T lymphocytes nor β-gal-specific Abs. β-Gal priming of protective CD8+ T lymphocytes was found to be CD4+ T cell-independent, to take place within the draining lymph nodes, and to be accomplished by day 5 after vaccination. Ablation of the injection sites as early as 1.5 h after pR-PV administration still led to protection in a large proportion of the animals, indicating that certain protein Ags administered intradermally in the context of polycations are quickly transported to the draining nodes, where they induce molecular and cellular events resulting in the helper-independent priming and expansion of Tc1 cells. However, optimal protection required the prolonged presence of the injection site, suggesting that pR-PV injection facilitates the formation of a cutaneous depot of Ag-charged cells capable of migration and T cell activation. In the last 10 years, major efforts have been devoted to the development of cancer vaccines. Although early studies used tumor cells themselves as a source of Ag (1, 2, 3, 4, 5), the steadily increasing identification and characterization of T cell-defined tumor Ags (6, 7) allowed for the development of cancer vaccines with defined antigenic specificity. These include the use of naked plasmid DNA (pDNA) (8, 9, 10), recombinant viral (11, 12), and bacterial (13) vectors, or of dendritic cells (DCs)3 either pulsed with synthetic peptides (14, 15, 16, 17, 18), protein Ags themselves (19, 20), or transfected with tumor-derived RNA (21). A different approach to induce and/or enhance tumor-specific immunity was developed by Schmidt and colleagues (22, 23, 24) who incubated murine, MHC class I-expressing cancer cells with a mixture of polycations (e.g., poly-l-arginine (pR), poly-l-lysine) and foreign, MHC-matched peptides. Injections of thus treated cells into syngeneic animals prevented specifically the growth of nonmodified tumor cells in both a prophylactic and therapeutic manner (22). The protective effect was the result of an immune response as evidenced by its specificity, systemic nature, and dependence on the presence of CD4+ and CD8+ T cells. Although it is known that polycations enhance peptide delivery to cells by 1–2 logs, the exact polycation-induced Ag uptake mechanisms are not yet entirely understood but apparently differ among the various polycations. pR, the most efficient compound identified thus far, relies on endocytic processes, whereas poly-l-lysine acts via a transient permeabilization of the cell membrane (23). The uptake rate is not only influenced by the type and dose of polycation used, but also by the biophysical properties of the peptide, including its hydrophobicity, charge, and proline content (25). At the present time, it is not clear whether tumor immunity induced by peptide-polycation-modified cancer cells is due to their direct T cell stimulatory property or, alternatively, results from cross-presentation of tumor-associated Ags (TAAs) by host APC. The latter possibility gains support from the observations that polycations can augment Ag delivery to APC and that injection of polycations together with MHC class I-matched peptide epitopes derived from molecules naturally expressed by cancer cells can protect experimental animals against the growth of syngeneic melanoma and mastocytoma cells (24). This could not be achieved by application of either component alone or of the antigenic peptides emulsified in IFA (24). In view of our only restricted knowledge of T cell epitopes displayed by TAAs, we sought to determine whether polycations could also enhance the immunogenicity of nonfragmented TAAs and, if so, which cellular events are operative in this process. Inbred BALB/c (H-2d) mice (6–10 wk old) were obtained from Charles River Wiga (Sulzfeld, Germany). For the in vivo experiments, animals were anesthetized by the i.p. injection of 200 μl of a mixture of ketamin (12.5 mg/ml; Ketalar; Parke-Davis, Vienna, Austria) and Xylazin (2 mg/ml) (Rompun; Bayer, Leverkusen, Germany). All animal procedures were approved by the Austrian Ministry of Science and Transportation (GZ66.009/18-Pr/4/2000). Cells were either grown in RPMI 1640, DMEM, or αMEM supplemented with 10% heat-inactivated FCS (PAA Laboratories, Linz, Austria), 25 mM (RPMI) or 10 mM HEPES (DMEM), respectively, 2 mM l-glutamine, 100 U penicillin, 100 μg/ml streptomycin, 0.1 mM nonessential amino acids, 1 mM sodium pyruvate, and 50 mM 2-ME (hereafter referred to as RPMI, DMEM, or αMEM standard medium). If not indicated otherwise, all media and reagents were purchased from Life Technologies (Paisley, U.K.). The mastocytoma cell line P815 (H-2d) was cultured in RPMI standard medium. Its β-galactosidase (β-gal)-expressing variant, P13.1, kindly provided by Dr. H.-J. Schild (Institute for Cell Biology, Department of Immunology, University of Tübingen, Tübingen, Germany), was cultured in RPMI standard medium supplemented with 0.5 mg/ml geneticin sulfate (G418). YAC cells were cultured in RPMI standard medium. The renal carcinoma line RENCA (H-2d) and its β-gal transfectant, RENCAlacZ, were generously provided by Dr. W. Wels (Georg Speyer Haus, Frankfurt, Germany). Both lines were cultured in RPMI standard medium, which was supplemented with 0.25 mg/ml Zeocin (Invitrogen, Groningen, The Netherlands) for the RENCAlacZ culture. By FACS analysis, both RENCA and RENCAlacZ cells express similar amounts of MHC class I (H-2d), CD44, CD54, and Mac-1 molecules, but lack MHC class II and B7-1/2 expression (data not shown). Previous experiments had shown that the s.c. inoculation of ≥1 × 106 RENCAlacZ cells into syngeneic BALB/c mice regularly results after 10–12 days in the appearance of rapidly growing tumors at the injection site (i-site; P. Lührs and A. Schneeberger, unpublished observations). The β-gal-specific CTL clone, kindly provided by Dr. H.-J. Schild, was cultured in αMEM standard medium containing 100 U mouse IL-2/ml. CTLs were restimulated using syngeneic, irradiated splenocytes (8000 mGy; x-ray device, Philips RT 305; Philips, Hamburg, Germany) pulsed with 50 ng/ml of the Ld-restricted, β-gal-specific peptide TPHPARIGL (26) in weekly intervals and were used for experiments after a rest of at least 7 days. The protein β-gal and the positively charged poly-amino acid pR were obtained from Sigma-Aldrich (Vienna, Austria). The β-gal-derived peptide TPHPARIGL and the H-2Kd-restricted influenza hemagglutinin peptide LFEAIEGFI were synthesized on a PE Biosystems model 433A peptide synthesizer (PE Biosystems, Weiterstadt, Germany) using standard fluorenylmethoxycarbonyl chemistry with feedback monitoring and preloaded chlorotrityl resins. Fluorenylmethoxycarbonyl amino acids with the appropriate protecting groups were purchased from Novabiochem (Läufelfingen, Switzerland). Cleavage from the resin and deprotection was achieved by reaction with a mixture of trifluoroacetic acid:triethylsilane:water (93:5:2) for 2 h at room temperature (RT). Peptides were separated from the resin by filtration and precipitated by adding a mixture of cold methyl-t-butyl ether:heptane (60:40). The peptides were collected by centrifugation, dried, and purified by C18 reversed-phase HPLC. Their integrity and identity was confirmed by matrix-assisted laser desorption/ionization-time of flight mass spectrometry using a Bruker Reflex III (Bruker, Billerica, MA). The β-gal-encoding pDNA was generated essentially as described (10). Briefly, the full-length lacZ cDNA was excised as NotI fragment from pDNA plasmid CMVβ (clone no. 77177; American Type Culture Collection, Manassas, VA) and ligated into the NotI cloning site of pDNA vector VR1012 (Ref. 27 ; kindly provided by B. Zaugg, Vical, San Diego, CA). In this construct, the lacZ cDNA is under the control of a human CMV intermediate-early promotor/enhancer region including an intron A sequence and located upstream of a bovine growth hormone polyadenylation signal. Correct orientation and lacZ cDNA sequence were confirmed by automated sequencing on an ABI PRISM genetic analyzer (PE Biosystems). pDNA was affinity-purified with the Endo-free Plasmid Mega kit (Qiagen, Hilden, Germany) and contained <0.04 IU μg−1 of endotoxin, as determined by the Limulus amebocyte lysate analysis kit (QCL-1000; BioWhittaker, Walkersville, MD). The protein β-gal (100 or 50 μg) was admixed with 60 μg pR in 0.27 M Sorbitol (R&P Margaritella, Vienna, Austria), 5 mM HEPES buffer (pH 8.0), and incubated for 1 h at RT. For control purposes, the same amount of either component alone was prepared under identical conditions. BALB/c mice were injected on day 0 and 14 intradermally (i.d.) into both ears with the pR-PV (50 or 100 μg β-gal and 60 μg pR/mouse), the same amounts of β-gal or pR alone or with 50 μg pDNA encoding β-gal. Some of the injected mice developed a local inflammatory response which was independent of the material injected and did correlate neither with the induction of a specific immune response nor with its strength. Animals (n = 2) were investigated for the presence of β-gal-specific T cells and Abs either on days 7 or 24. For tumor challenge experiments, vaccinated BALB/c mice (n = 4–13) were s.c. inoculated on day 24 with 2 × 106 viable RENCA or RENCAlacZ tumor cells into the back. Animals were assessed regularly for the presence of tumors, and tumor volumes were determined at the indicated time points by measuring the largest diameter and the two largest right angle diameters to it. Animals were sacrificed when the largest tumor diameter exceeded 1.5 cm or tumors became ulcerated. To deplete T lymphocytes or subpopulations thereof, animals (n = 2–7) were treated with Abs to CD4 (GK1.5) or CD8 (YTS169) (300 μg/injection). Three different protocols were used: 1) to study the CD4 dependence of the CD8 response, mice were injected with anti-CD4 Abs on days −2, −1, and 1, immunized on day 0, and evaluated on day 7 (ELISPOT); 2) to study the CD4 dependence of the humoral immune response and of the protective effect, animals received anti-CD4 Abs on days −2, −1, 1, 12, 13, and 15, were immunized on days 0 and 14, and evaluated (tumor challenge, humoral immune response) on day 24; 3) to delineate the T cell population that mediates the protective effect, immunized mice received anti-CD4 or anti-CD8 Abs on days 22 and 23 as well as 25 and were challenged on day 24. These Ab treatments reduced the respective T cell subset by >98% as determined by FACS analysis on days 7 (protocol 1), 7, 14, and 24 (protocol 2), and 34 (protocol 3). A representative experiment is shown in Fig. 4⇓. MACS separation columns (MS; Miltenyi Biotec, Bergisch Gladbach, Germany) were used to prepare CD4+ T cells. Briefly, spleen cells of immunized mice were incubated with anti-CD4 Ab conjugated to magnetic beads (Milteny Biotec) for 15 min in PBS/1% FCS/0.2 M EDTA (MACS buffer) at 4°C according to the manufacturer’s recommendation. Cells were washed to remove excessive, nonbound anti-CD4 Ab beads and loaded onto prewashed MACS columns. Nonbound cells were then washed through by applying three column volumes of the MACS buffer while the column was still attached to the magnet. Finally, the retained population was eluted by removing the column from the magnet and adding two column volumes of the MACS buffer. After trypsin-induced detachment, aliquots of RENCA and RENCAlacZ cells were reacted for 30 min at 4°C with FITC-labeled Abs to CD44 (BD PharMingen, San Diego, CA), CD54 (BD PharMingen), Mac-1 (Boehringer Mannheim, Indianapolis, IN), MHC class II (ATCC), B7-1 (BD PharMingen), and B7-2 (BD PharMingen), with nonlabeled Abs to MHC class I (BD PharMingen) and β-gal (Sigma-Aldrich) or with appropriate isotype-matched control Abs. Cells that had been incubated with the Abs to MHC class I, β-gal, or the respective control Abs were washed and then exposed to FITC-conjugated second step reagents (goat anti-mouse; Caltag Laboratories, San Francisco, CA). β-Gal-expression was analyzed in intact and permeabilized cells. For permeabilization, cells were treated for 10 min with paraformaldehyde (0.25% in PBS), washed, and then incubated with saponin (0.3% in PBS supplemented with FCS (1%) for 10 min at RT; Ref. 28). The efficiency of CD4+ or CD8+ cell depletion was checked by FACS analysis using FITC-labeled Abs to CD8 (YTS169), CD4 (GK1.5), or CD3 (2C11). Fluorescence was measured using a FACScan, and dead cells were excluded by propidium iodide (Sigma-Aldrich) staining. Fluorescence parameters of 10,000 living cells were acquired and analyzed with CellQuest software (BD Biosciences, Mountain View, CA). To investigate the time course of polycation-induced immune responses, mice received pR-PV injections into both ears at the indicated time points and were thereafter analyzed for the presence of Ag-bearing APCs within the draining lymph nodes as well as of Ag-specific T cells within the regional lymph nodes and spleens. 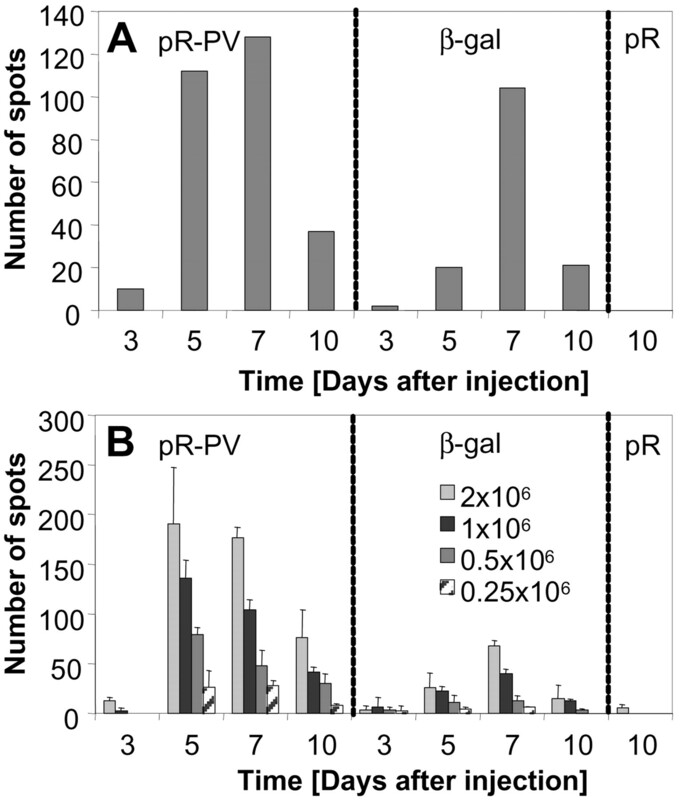 For the detection of Ag-bearing cells within the draining lymph nodes, groups of BALB/c mice (n = 8) were injected on day 0 with the pR-PV, or with either β-gal or pR alone into both ears. Their cervical and mesenterial lymph nodes were removed 1, 2, 3, or 4 days after injection and single-cell suspensions thereof prepared. A total of 4 × 105 lymph node cells were cocultured for 48 h with 4 × 104 β-gal-specific CTLs. The amount of IFN-γ secreted by the CTLs was determined by ELISA. To investigate the time required for T cell priming, lymph nodes and spleens of animals (n = 2) that had received β-gal or the pR-PV into both ears on day 0 were analyzed for the presence of β-gal-specific T cells on days 3, 5, 7, and 10 using the IFN-γ ELISPOT assay. To study the role of the cutaneous immunization site in the induction of the immune response, ears were surgically removed 1.5 h, 1, or 11 days after the injection of the pR-PV, and animals were analyzed on day 12 for the presence of β-gal-specific T cells. In a second series of experiments, mice were injected with the pR-PV on day 0 into the left and on day 14 into the right ear. The respective ears were ablated 1.5 h after vaccination. Thus, treated animals were challenged on day 24 with 2 × 106 RENCAlacZ tumor cells and monitored for tumor growth. Multiscreen 96-well assay plates (Millipore, Bedford, MA) were precoated overnight at 4°C with 5 μg/ml anti-IFN-γ Ab R4-6A2 (29) in 0.1 M sodium carbonate buffer, pH 9.3. After washing with PBS/0.05% Tween 20, the plates were blocked for at least 2 h with DMEM standard medium. Whole spleen and lymph node cells as well as splenic CD4+ cells of naive and immunized mice were plated in duplicates at the indicated cell numbers in 100 μl DMEM standard medium. The function of CD8+ T cells was assessed by restimulation of the spleen and lymph node cells with the H-2Ld-restricted β-gal peptide (TPHPARIGL, 40 μg/ml, 100 μl/well). CD4+ T lymphocytes were restimulated by the addition of 5 × 105 irradiated splenocytes (15000 mGy; x-ray device, Philips RT 305) and β-gal (final concentration 100 μg/ml). The plates were incubated overnight at 37°C/5% CO2 and, after extensive washing, the biotinylated anti-IFN-γ Ab AN18.17.24 (2 μg/ml; Ref. 29) was added for 2 h. Detection was conducted with peroxidase conjugated to streptavidin (Boehringer Mannheim; dilution, 1/5000 for 1 h) followed by the addition of 100 μl substrate (0.8 mg/ml 3,3′-diaminobenzidine (Sigma-Aldrich)/0.4 mg/ml NiCl2 (Sigma-Aldrich)/0.009% H2O2 in 0.1 M Tris, pH 7.5). The reaction was stopped after 10–30 min by washing with deionized H2O. This resulted in discrete black spots representing sites where IFN-γ-secreting T cells had previously been located. The spots were counted using the Bioreader-2000 (Biosys, Karben, Germany). Preliminary experiments had shown that culture of splenocytes in medium alone or with an irrelevant H-2Kd-restricted influenza hemagglutinin peptide (LFEAIEGFI) consistently led to low and comparable spot numbers (see Fig. 2⇓A and data not shown). Therefore, the number of peptide-specific IFN-γ-positive spots was obtained by subtracting the number of spots in the medium alone group from that in the peptide group. Splenocytes were isolated 10 days after the second vaccination and cultured for 5 days in 24-well tissue culture plates (4 × 106/2 ml/well) with 50 ng of the MHC class I-restricted β-gal peptide. The cytotoxic potential of the β-gal peptide-exposed splenocytes was measured in an Europium (Eu3+) release assay as described previously (4, 10). The IFN-γ concentration within the supernatants of cell cultures was measured with a sandwich ELISA, using the anti-IFN-γ Abs R4-6A2 and biotinylated AN18.17.24 for capture and detection, respectively. Streptavidin-peroxidase was used according to the manufacturer’s instructions. ABTS (Sigma-Aldrich) was used as substrate, and absorption was measured at 405 nm. To determine the concentration of β-gal-specific Abs in the sera of vaccinated mice, 96-well Nunc-Maxisorb plates were coated with 5 μg/ml β-gal (Sigma-Aldrich). An alkaline phosphatase-conjugated goat anti-mouse-IgG (Southern Biotechnology Associates, Birmingham, AL) was used for detection and p-nitrophenyl phosphate (Sigma-Aldrich) as substrate. A β-gal-specific Ab (starting with 5 μg/ml serially diluted; Sigma-Aldrich) was used to standardize the ELISA. OD was determined at 405 nm. The Sigma Stat software (SPSS, Chicago, IL) was used to evaluate statistical differences in tumor sizes between the different groups after immunization. Based on the raw data, this program uses either Student’s t test (normal distribution applies) or the Kruskal-Wallis one-way analysis (normal distribution does not apply). The Mann-Whitney U test was used to evaluate tumor incidence between the different groups. A value of p ≤ 0.05 was considered to be significant. All series of experiments were repeated at least once. The model Ag β-gal was chosen to study the events that occur after i.d. application of a polycation-based protein vaccine. We first asked whether the administration of β-gal in combination with pR is able to protect animals against the growth of β-gal-expressing tumor cells in a prophylactic vaccination model. For this purpose, groups of BALB/c mice were injected i.d. into both ears twice at a 2-wk interval with the pR-PV or with either of its two components, i.e., β-gal and pR. The i.d. route was chosen because preliminary experiments had shown that it was superior to s.c. pR-PV administration regarding its ability to protect animals against the growth of RENCAlacZ cells. A pDNA encoding β-gal was used as an assay control based on experiments consistently demonstrating its ability to elicit protective immunity in this animal model of human cancer (Ref. 10 and A. Schneeberger, P. Lührs, G. Stingl, and S. N. Wagner, manuscript in preparation). Ten days after the second vaccination, the animals were inoculated s.c. into the back with 2 × 106 parental RENCA or RENCAlacZ cells, respectively. As shown in Table I⇓, we found that the injection of RENCAlacZ cells led to the appearance of tumors in 20/22 naive controls (total number of mice treated in three independent experiments) and 6/6 pR recipients. Tumors were already detectable 2 wk after implantation of the RENCAlacZ cells and grew to a size of 1.5 cm (longest diameter) by wk 6. In contrast, only 3/24 pR-PV recipients developed tumors during an observation period of 9–11 wk. These exhibited latency periods as well as growth kinetics similar to those seen in the untreated and pR-injected control animals. 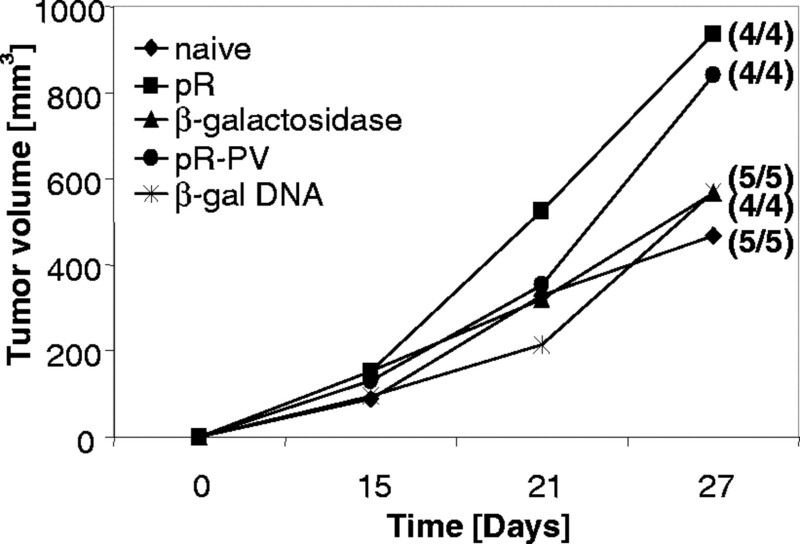 On average, the protection rates obtained with the pR-PV ranged from 77.8 to 100% (n = 3 experiments) and were comparable to those achieved by β-gal pDNA (range: 83.3–100%, n = 3 experiments). The protection rates of these two vaccines exceeded by far the ones obtained in animals that had received the protein alone (range: 30.8–37.5%, n = 2 experiments). To test whether the protective effect of the various treatments is Ag-specific, groups of mice that had received the pR-PV, β-gal, or β-gal-pDNA were challenged with the parental RENCA tumor cells. All of these animals developed tumors which grew at a rate comparable to that seen in untreated or in pR-injected control mice (Fig. 1⇓). Together, these results demonstrate that pR significantly enhances the immunogenicity of intracutaneously administered β-gal. To determine whether the protective effect was long lasting, pR-PV-injected mice that had resisted the first RENCAlacZ challenge were inoculated 7 mo later with either RENCAlacZ or syngeneic P815 tumor cells. Results obtained showed that these animals were capable of rejecting RENCAlacZ (tumor bearing/total = 0/9) but not P815 cells (tumor bearing/total = 4/4; data not shown). To test the efficacy of the vaccine in a therapeutic setting, BALB/c mice were inoculated on day 0 with 1 × 106 RENCAlacZ cells and received the pR-PV on days 1, 6, 11, and 16. The vaccine was applied into the ear pinna using the dose that had proven efficient in the prophylactic model. This preliminary protocol yielded no clear benefit as compared with naive and β-gal-treated mice and, at best, slightly delayed the speed of occurrence and the growth rate of tumors (data not shown). The protective effect of the pR-PV is Ag-specific. Groups of BALB/c mice (n = 4–5) that had been injected twice (days 0 and 14) into the pinna of both ears with either the pR-PV (50 μg β-gal/60 μg pR), β-gal (50 μg), pR (60 μg), or β-gal-expressing pDNA (50 μg) were challenged on day 24 by the s.c. inoculation (back) of RENCA cells. Tumor incidence and tumor volume were regularly assessed and documented. In view of the protective effect of the pR-PV, we next asked whether the injection of pR-PV would elicit β-gal-specific T cells. An ELISPOT system was used to measure T cells specific for the immunodominant Ld-restricted β-gal-peptide epitope (TPHPARIGL). To this end, splenocytes of mice injected with the pR-PV, either of its components, or β-gal-DNA were isolated 10 days after the second injection, restimulated with the peptide, and the number of IFN-γ-secreting cells was quantified. As shown in Fig. 2⇓A, stimulating 1 × 106 splenocytes of naive, pR-treated mice or of animals that had received 50 μg of the protein alone with the immunodominant, MHC class I-restricted peptide epitope yielded background numbers of spots. In contrast, evaluation of mice that had received 50 μg β-gal in combination with pR revealed 70 ± 2.1 spots representing peptide-specific T cells. pR was also capable of increasing the number of specific T cells at a protein dose (100 μg) that by itself elicits β-gal-specific T cells upon injection into the ear pinna. The strength of the MHC class I-restricted T cell response induced by injecting β-gal together with pR was comparable to our control, i.e., the i.d. administration of 50 μg β-gal pDNA (10), which resulted in 205 ± 45.7 β-gal-specific spots per 1 × 106 spleen cells. To determine the cytotoxic activity of the vaccination-induced, β-gal-specific T cells, splenocytes from vaccinated animals were restimulated for 5 days with the immunodominant, MHC class I-restricted, β-gal epitope and then tested for their capacity to lyse europium-labeled target cells. Results showed that spleen cells from β-gal DNA (Fig. 2⇓E) and to a lesser extent of pR-PV recipients (Fig. 2⇓D) were able to lyse haplotype-matched, β-gal-expressing P13.1 target cells in an Ag-specific manner. No lytic activity was detected when spleen cells from β-gal- (Fig. 2⇓C) or pR-treated (Fig. 2⇓B) animals were used. To assess the capacity of the protein vaccine to stimulate the CD4+ T cell compartment, splenic CD4+ T lymphocytes of pR-PV recipients as well as control mice were stimulated with irradiated, syngeneic spleen cells in the presence of β-gal and then subjected to an IFN-γ ELISPOT assay. Fig. 2⇓F shows that 5 × 105 β-gal-stimulated CD4+ T cells of mice that had been injected twice with pR, β-gal, the pR-PV, and β-gal pDNA resulted in 0; 71 ± 20.5; 48 ± 26.9, and 320 spots, respectively (Fig. 2⇓F). The capacity of the vaccines to augment the CD4-dependent immune response was also evidenced by our finding of elevated β-gal-specific serum Abs in pR-PV as compared with β-gal recipients (Fig. 2⇓G). Injection of the pR-PV induces Ag-specific T cells (A–F) and Igs (G). Groups of BALB/c mice (n = 2) were injected into the pinna of both ears on days 0 and 14 with either pR (60 μg; A, B, F, G), β-gal (50 μg (A); 100 μg (A, C, F, G)), pR-PV (β-gal 50 μg (A), 100 μg (A, D, F, G); 60 μg pR) or with 50 μg of β-gal-encoding pDNA (A, E, F). On day 24, spleen cells were analyzed for the presence of β-gal-specific MHC class I-restricted T cells (A) and β-gal-specific CD4+ T cells (F) by ELISPOT analysis. Splenocytes of animals that had been treated with pR (B), β-gal (C), pR-PV (D), or β-gal DNA (E), respectively, were stimulated for 5 days with the H-2d-restricted immunodominant β-gal peptide epitope and tested for their ability to lyse P815, P13.1, and YAC cells using a 4-h europium release assay. G, Sera of pR-, β-gal-, and pR-PV-treated animals were assessed for β-gal-specific Abs by ELISA. Some of the pR-PV recipients were depleted of CD4+ T cells by the i.p. administration of Abs to CD4 (GK1.5, 300 μg/injection/days −2, −1, 1, 12, 13, and 15). 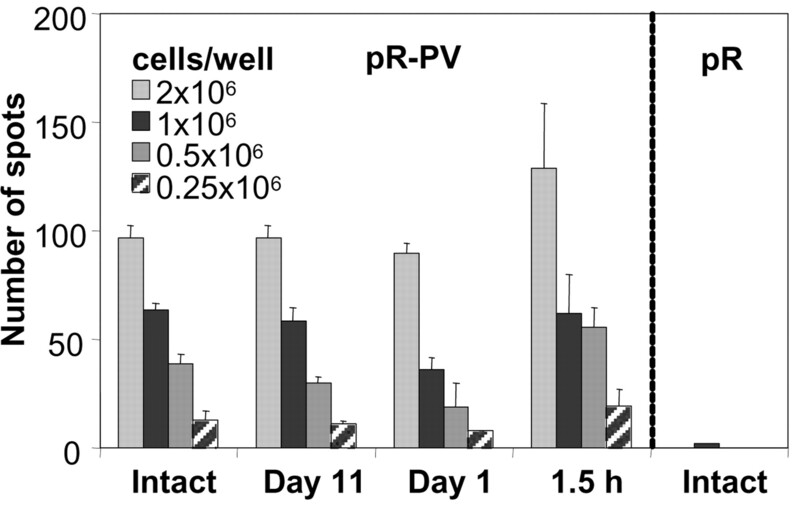 To determine the relative importance of the various effector cells/molecules for the pR-PV’s protective effect, we depleted pR-PV recipients of CD4+ or CD8+ cells just before challenging them s.c. with 2 × 106 RENCAlacZ cells. In this series of experiments, all naive animals developed exponentially growing tumors. In contrast, none of the animals that had been injected with the pR-PV did so over the entire observation period of 40 days. The protective effect of the pR-PV was not affected by the elimination of the CD4+ Th cells, but was completely abrogated upon depletion of CD8+ T cells (Fig. 3⇓A). We do not believe that pR-PV-induced β-gal-specific Abs play a major role in the rejection of the Ag-expressing tumor cells because 1) β-gal-specific Abs failed to react with nonpermeabilized RENCAlacZ cells (Fig. 3⇓B); and 2) CD8-depleted animals developed tumors despite the fact that they exhibit normal levels of β-gal-specific Abs (Fig. 3⇓A). β-Gal-specific, CD8-positive T cells but not Abs mediate the protective effect of the pR-PV. A, BALB/c mice (n = 6) were injected into the pinna of both ears with the pR-PV (100 μg β-gal; 60 μg pR) on days 0 and 14. Some of the animals were depleted of T lymphocyte subsets by the i.p. administration of Abs to CD4 (GK1.5, 300 μg/injection) or CD8 (YTS169, 300 μg/injection) on days 22, 23, and 25. Animals were challenged by the s.c. inoculation of 2 × 106 RENCAlacZ cells on day 24 and tumor volumes were regularly assessed and documented. Tumor sizes of CD8-depleted and pR-PV-injected mice differed significantly from those of intact as well as CD4-depleted pR-PV recipients (intact pR-PV:CD8-depleted pR-PV, p < 0.005; CD4-depleted pR-PV:CD8-depleted pR-PV, p < 0.005). B, RENCA and RENCAlacZ tumor cells were either permeablized or left intact and stained with an anti-β-gal Ab. Detection was performed using an FITC-labeled goat-anti-mouse Ab and cells were analyzed by FACS. To determine the role of helper cells in the generation of the specific CD8+ T cells, we injected animals i.p. with the anti-CD4 Ab GK1.5 to deplete their CD4+ T cell population before the vaccination. Thus, treated mice were evaluated 7 days after immunization for the presence of T cells recognizing specifically the MHC class I-restricted β-gal epitope. Results obtained not only showed that CD4-depleted (>98% reduction, a representative experiment is given in Fig. 4⇓) animals are perfectly able to mount a β-gal-specific MHC class I-restricted T cell response, but even suggested that the specific T cell response induced is more pronounced in CD4-depleted as compared with intact mice (Fig. 5⇓A). To test the in vivo significance of this finding, we performed tumor challenge experiments. To this end, mice were immunized twice on day 0 as well as 14 and challenged on day 24. Some of them received anti-CD4 Abs before each vaccination. In such animals, FACS analysis on days 7, 14, and 24 demonstrated a >98% reduction of the CD4+ T cells (a representative experiment (day 24) is given in Fig. 4⇓). Although CD4 Ab-treated pR-PV recipients failed to mount a β-gal-specific humoral response (Fig. 2⇑G), they were perfectly capable of rejecting an otherwise lethal RENCAlacZ inoculum (Fig. 5⇓B). Injection of GK1.5 led to the elimination of CD4+ T cells. Splenocytes of untreated control animals and mice that had received β-gal or pR-PV on days 0 and 14 as well as Abs to CD4 (GK1.5, 300 μg/injection) on days −2, −1, 1, 12, 13, and 15 were evaluated on day 24 for presence of CD4-, CD8-, and CD3-positive T cells by FACS analysis. Numbers indicate the percentage of positive cells as defined by the respective isotype control. CD4+ T cells are not required for the induction of Ag-specific, protective CD8+ T cells. A, Groups of BALB/c mice (n = 2) were injected into the pinna of both ears on day 0 with either pR (60 μg), β-gal (100 μg), or with pR-PV (100 μg β-gal, 60 μg pR). Some of the β-gal or pR-PV recipients were injected i.p. on days −2, −1, and 1, with Abs to CD4 (GK1.5, 300 μg/injection). Splenocytes of mice were evaluated for the presence of β-gal-specific MHC class I-restricted T cells on day 7 by ELISPOT analysis. B, Groups of BALB/c mice (n = 5–7) were injected with pR-PV on days 0 and 14 and challenged on day 24 with RENCAlacZ tumor cells. Some animals were depleted of CD4-positive T cells by the i.p. administration of Abs against CD4 (GK1.5, 300 μg/injection/day −2, −1, 1, 12, 13, and 15). Throughout the experiment, the difference in tumor incidence was statistically significant between naive and pR-PV-injected/CD4-depleted animals (p < 0.01) as well as naive and pR-PV-injected animals (p < 0.05). To characterize the events that lead to T cell activation, we assessed various lymphoid organs for the presence of β-gal-bearing APCs as well as β-gal-specific T cells at various time points after a single vaccination. 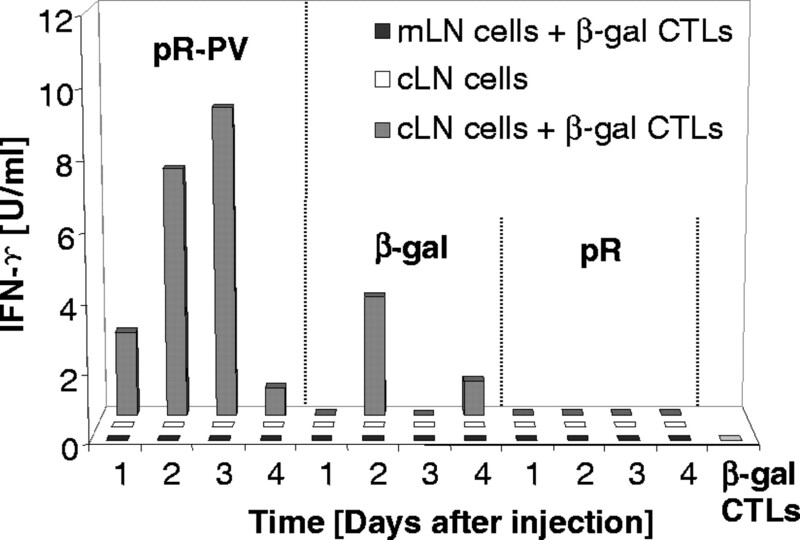 To detect Ag-bearing APCs, single-cell suspensions were prepared of draining (cervical) and nondraining (mesenterial) lymph nodes on days 1, 2, 3, and 4 after the administration of the pR-PV, β-gal, or pR and cocultured with a β-gal-specific CTL clone. IFN-γ present in the supernatant of the cocultures and presumably produced by the CTL clone was used as a measure for the presence of Ag-bearing APCs. Indeed, incubation of cervical lymph node cells (4 × 105) from pR-PV recipients together with the specific CTL clone (4 × 104) led to the secretion of IFN-γ into the supernatant. The cytokine was already detectable by day 1, peaked on days 2 and 3, and declined thereafter (Fig. 6⇓). Cultures containing either the cervical lymph node cells or the β-gal-specific CTL clone only did not contain detectable amounts of IFN-γ (Fig. 6⇓). Regional lymph node cells of mice that had received β-gal alone were also able to stimulate IFN-γ production by the CTL clone but to a much lesser extent than those of pR-PV recipients. No IFN-γ was found when cervical lymph node cells of pR-injected or of naive control animals were used to stimulate the β-gal-specific CTL clone (Fig. 6⇓). At least until day 4, nondraining mesenterial lymph nodes of the pR-PV recipients did not contain such Ag-bearing APCs (Fig. 6⇓), indicating that the activation of the specific immune response occurs within the regional nodes. 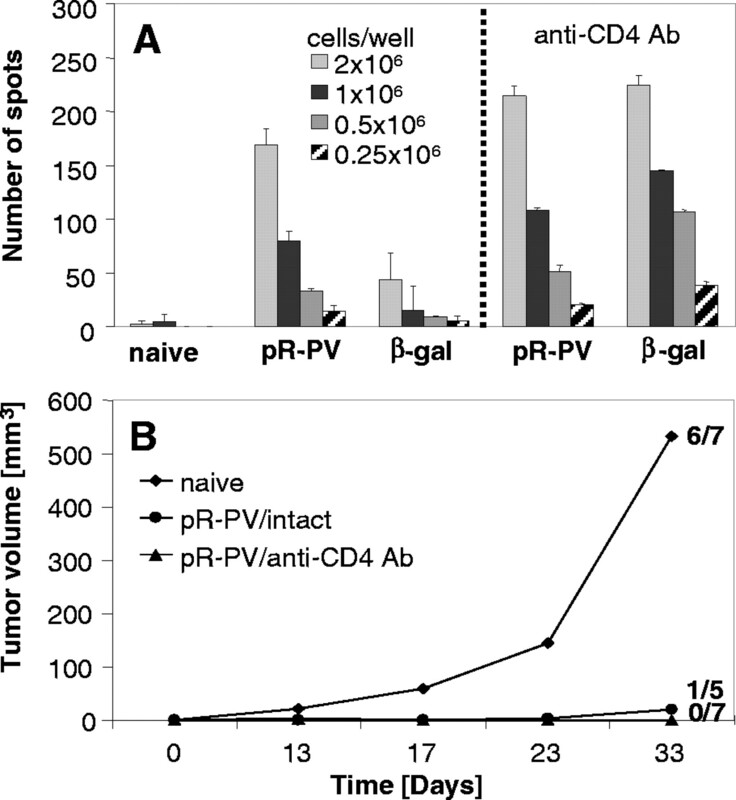 β-Gal epitope-bearing APCs are detectable on day 2 after injection of the pR-PV. BALB/c mice (n = 8) were injected into the pinna of both ears with the pR-PV (100 μg β-gal, 60 μg pR), β-gal (100 μg), or pR (60 μg). Cervical (cLN) and mesenterial lymph nodes (mLN) were removed and single-cell suspensions thereof prepared 1, 2, 3, and 4 days later. A total of 4 × 105 of these lymph node cells were then cultured with or without the β-gal-specific CTL clone (4 × 104) for 48 h, and the IFN-γ secreted by the CTLs was measured by ELISA. Similar results were obtained in three independent experiments. Based on these results, the regional lymph nodes and the spleen were analyzed on days 3, 5, 7, and 10 after pR-PV administration for the presence of β-gal-specific lymphocytes. For this purpose, spleen as well as lymph node cells were restimulated overnight with the immunodominant, Ld-restricted β-gal epitope and the resulting IFN-γ-producing cells were quantified by ELISPOT analysis. Regional lymph nodes and spleens contained few if any β-gal-specific T cells 3 days after pR-PV administration, but were found to harbor substantial numbers of these cells on days 5 and 7. At both of the latter time points, the frequency of specific T cells was found to be higher within the regional lymph node (112 and 128 spots/0.5 × 106 cells; Fig. 7⇓A) as compared with the spleen (136 ± 17 and 104 ± 9.9 spots/1 × 106 cells; Fig. 7⇓B). Their numbers dropped significantly thereafter. Similar, although slightly delayed kinetics were seen following administration of β-gal alone (Fig. 7⇓, A and B). pR-PV administration elicits β-gal-specific T cells within 5 days. Lymph node (A; 5 × 105cells/well) or spleens cells (B) of BALB/c mice (n = 2) that had been injected on day 0 into the pinna of both ears with the pR-PV (100 μg β-gal, 60 μg pR), β-gal (100 μg), or pR (60 μg) were analyzed for β-gal peptide-reactive T cells on days 3, 5, 7, and 10 using an IFN-γ ELISPOT assay. The experiment was repeated with similar results. Together, these results supported the view that the Ag-bearing cells found within the regional lymph nodes a few days after injection of the pR-PV are critically involved in the process leading to T cell activation. These cells could represent mobile cells that have taken up the antigenic material at the i-site or, alternatively, resident lymph node cells having engulfed the β-gal protein which had reached the node via the lymphatic vessels. Assuming that the transport of a protein solution via the lymphatics would be much faster than cells migrating from the skin to the regional node, we asked whether pR-PV recipients, in which the i-site had been removed early after the administration of the pR-PV, would be able to mount a specific immune response. To this end, BALB/c mice were injected into both ears with 50 μl of the pR-PV, their ears were surgically removed 1.5 h, 1, or 11 days later, and the animals were tested on day 12 for the presence of β-gal-specific T cells. As shown in Fig. 8⇓, the frequency of β-gal-specific lymphocytes in all of these three groups was comparable to that of mice in which the i-site was not ablated. Early ablation of the i-site does not affect the magnitude of the immune response. BALB/c (mice, n = 2) were injected into the pinna of both ears with the pR-PV (100 μg β-gal, 60 μg pR) or pR (60 μg). The i-sites were removed at the indicated time points and the frequency of β-gal-specific IFN-γ-producing T cells was determined with an ELISPOT assay on day 12. The results are representative of three independent experiments. To determine the biological significance of this finding, we injected BALB/c mice twice at a 14-day interval with the pR-PV leaving one group of animals untreated while removing the immunization sites of the members of the other group 1.5 h after each vaccination. These two groups of mice as well as naive control animals were challenged 10 days after the second vaccination. The protection rates of both vaccinated groups (intact mice: 7/9 (78%), i-site ablated mice: 7/9 (78%)) were equal during the first 26 days (Table II⇓). Thereafter, the protection rate of the intact animals remained constant, while another two of the i-site-excised mice developed tumors resulting in a decline of the protection rate to 5/9 (56%). Still, this protection rate was markedly better than that seen in the negative control group (Table II⇓). In this study, we demonstrate that the injection of the model Ag β-gal leads to the activation of β-gal-specific CD4+ and CD8+ T lymphocytes as well as B cells and that this immune response was greatly augmented by the coadministration of the polycation pR. This was paralleled by an increase in the animals’ ability to reject β-gal-expressing RENCAlacZ cells. The protective effect of pR-PV was critically dependent on the presence of CD8+ T cells. Priming of these CD8+ T cells was independent of CD4+ Th cells which in turn were required for the production of β-gal-specific Abs. The immune response was generated within the lymph nodes draining the i-sites, and transport in a non-cell-bound form via lymphatic vessels appeared to be the major route by which the Ag reaches the site of T and B cell activation. Earlier studies had demonstrated that cationic poly-amino acids enhance the antitumor activity of coadministered tumor cells (22) as well as tumor-derived, MHC class I-restricted peptides (22). To study the immunostimulatory properties of the cationic poly-amino acid pR, we used the protein Ag β-gal, which is known to contain class I- and II-restricted T cell as well as B cell epitopes (30). Its i.d. administration was found to induce specific IFN-γ-producing CD4+ and CD8+ T as well as B lymphocytes but it failed to induce a detectable CTL response. The lower level of sensitivity of the CTL as compared with the ELISPOT assay most likely accounts for the discordant results obtained with the two assay systems (31). The coadministration of pR markedly augmented the frequency of the specific class I-restricted CD8+ T cells as well as the titer of specific Abs and allowed the induction of detectable levels of specific CTLs. In addition, it appeared to slightly accelerate the activation of the CD8+ T cells, but it had no measurable effect on the number of IFN-γ- and IL-4- (P. Lührs, unpublished observations) producing CD4+ T lymphocytes. Parallel to its stimulatory effects on the CD8+ T and B cell response, pR led to a far better protection than β-gal alone. Although the i.d. 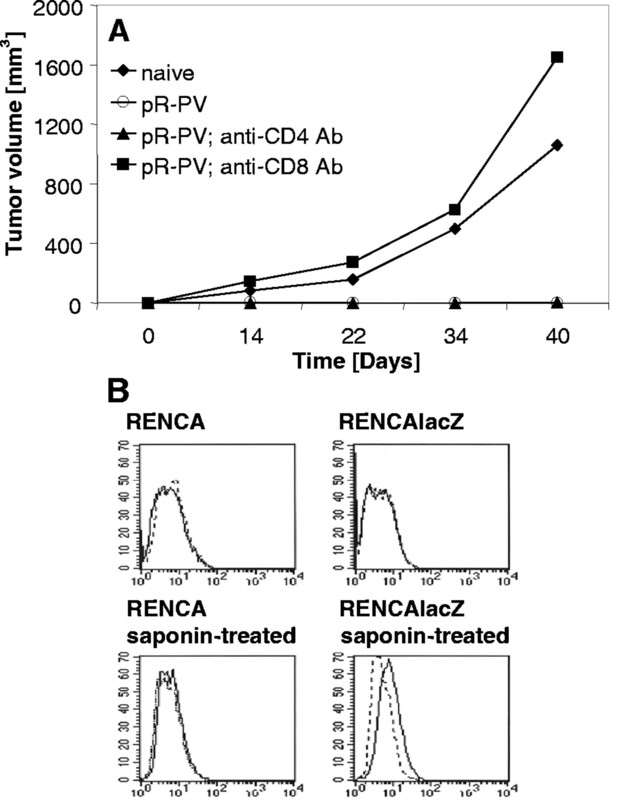 injection of the protein alone prevented the appearance of RENCAlacZ tumors in 30.8–37.5% of the animals, the pR-PV was found to protect 78–100% of the recipients in an Ag-specific manner. Therefore, the antitumor activity of the pR-PV was comparable to genetic immunization using a CMV promoter-driven VR1012 β-gal plasmid. Interestingly enough, the latter proved to be superior in its capacity to elicit MHC class I-restricted, β-gal-specific T cells. Reasons for this discrepancy may include the limited stringency of the prophylactic tumor model used as well as the possibility that the immune responses triggered by the two types of vaccines differ markedly regarding their kinetics, quality, and effector mechanisms. In case of the pR-PV, our T cell depletion studies identified CD8+ T lymphocytes as being critical and sufficient to protect mice against the growth of RENCAlacZ cells. Neither CD4+ T cells (as assessed by in vivo T cell depletion studies) nor the β-gal-specific Abs induced appeared to contribute to the pR-PV-driven tumoricidal processes. The latter notion was deduced from the observations that 1) β-gal-specific Abs did not stain the surface of intact RENCAlacZ cells; 2) CD8-depleted animals developed tumors upon RENCAlacZ inoculation while exhibiting a normal β-gal-specific Ab response (Fig. 3⇑A); and 3) transfer of serum from pR-PV recipients did neither prevent nor delay the growth of RENCAlacZ as compared with naive animals (data not shown). These observations do not exclude the possibility that specific Abs, once induced, contribute to the protective effect by focusing the Ag to APCs, thereby amplifying the protective CD8 response (32). NK cells, another potential effector cell population, play apparently no major role in the tumor-destructive events since pR administration fails to activate their lytic activity (data not shown). This view is further supported by the finding that, while preserving the NK cell population, treatment of mice with Abs to CD8 either alone or in combination with CD4 Abs (Fig. 3⇑A and data not shown) abrogated the protective effect of pR-PV administration. Concerning the mode of activation of the MHC class I-restricted, specific, and protective CD8+ T lymphocytes, we were first interested in defining the site of their generation. For this purpose, draining as well as nondraining lymph nodes and the spleen (data not shown) of β-gal and pR-PV recipients were analyzed for the presence of cells presenting a β-gal-derived, class I-restricted antigenic epitope. To this end, these organs were removed at defined time points after Ag injection and cells thereof were cocultured with a CTL clone recognizing the immunodominant class I-restricted β-gal epitope. In both groups of mice, the regional nodes were the only lymphoid organ that contained APCs capable of stimulating the CTL clone to produce IFN-γ. They were detected somewhat earlier in the pR-PV (day 1) as compared with the protein group (day 2). Lymph node cells of the pR-PV recipients stimulated a more pronounced IFN-γ signal than did those of the protein alone-injected animals. One explanation for this could be that polycations augment the number and/or the stimulatory activities of the APCs involved. Experiments showing that incubation of bone marrow-derived DCs with titrated doses of pR did not elevate their expression of the costimulatory molecules CD40, CD80, and CD86 (P. Lührs, unpublished observations) render the latter possibility unlikely. Another parameter critically influencing the immunostimulatory potential of APCs is the density of MHC/Ag complexes on their surface. Such a mechanism has recently been shown to augment the immunostimulatory potential of DCs (33). Especially in the case of cross-presentation (34, 35, 36, 37, 38, 39), the amount of Ag appears to be the major factor determining the outcome of an immune response (40, 41). When examining the requirements for entry of exogenous Ag into the MHC class I presentation pathway, Kurts et al. (40) showed that Ags constitutively gain access to this pathway only when they are available in relatively high doses. Indeed, cationic poly-amino acids and, more specifically, arginine homopolymers have been shown to augment the delivery of peptides and proteins to cells by 1–2 logs (23, 42, 43, 44). This process occurs in a rapid fashion that is independent of receptors and transporters but instead thought to target the lipid bilayer of the cell membrane (43, 44). Consequently, the molecules delivered should primarily end up within the cytosol of a given cell. In line with this was our observation that pR augments the frequency of the specific CD8+ but not the one of CD4+ T lymphocytes. It was interesting to note that CD4+ helper T cells were not required for the generation of the Ag-specific and MHC class I-restricted T lymphocytes independent of whether β-gal or the β-gal/pR mixture was used to immunize the animals. It even appeared that the pR-PV-induced CD8 response as well as the tumor protection were more pronounced in the absence of CD4+ cells. This mode of protection differed from that obtained with tumor cell-based vaccines which, in most cases, rely on both specific CD4+ as well as CD8+ T lymphocytes (4, 45). Future experiments will have to clarify whether injection of a protein or the pR-PV induces a fraction of CD4+ T lymphocytes which, instead of facilitating, would even inhibit the generation and/or function of specific CD8+ T cells (46, 47, 48). Concerning the question as to how the Ag reaches the regional lymph node, two mutually nonexclusive possibilities can be entertained. Prevailing opinion holds that the Ag is picked up by APCs at the i-site which carry it to the regional node (3, 49). Morphological evidence suggesting that the pR-PV relies on this pathway has recently been provided by Mattner et al. (50), who found Ag-bearing MHC class II+ DCs at the immunization sites. Alternatively, afferent lymph vessels could drain the extracellularly deposited Ag, like other components of interstitial fluids, to the regional nodes. There, it could be captured by local APCs and presented in an immunologically relevant form to T and B lymphocytes. This pathway has recently been demonstrated to mediate the protective antiviral and antitumor immunity of a liposomal peptide vaccine (51). In addition, it appears to be operative upon epicutaneous application of certain contact allergens such as FITC (52). To differentiate between these two possibilities on a functional level, we sought to determine the length of time the i-site has to stay intact for the protective CD8 response to occur. The prediction would be that the i-site has to stay intact for a few days if transport by APCs applies while minutes to hours should be sufficient to drain the β-gal solution to the regional node. To our surprise, removal of the i-site as early as 1.5 h after pR-PV administration did not reduce the frequency of β-gal-specific T cells as compared with intact animals and detected by day 12 after vaccination. Even more important was the demonstration that the majority of the i-site-excised animals were still able to reject the tumor inoculum. This indicated that transport of the pR-PV in a non-cell-bound fashion via afferent lymphatics is sufficient for the elicitation of Ag-specific and protective T cells. The finding that the protection rate of the i-site-excised mice, although initially being comparable to the one of the intact animals, dropped at later time points may indicate that a constant influx of Ag from a cutaneous depot or of Ag-laden, migratory APC is needed for optimal antitumor immunity. At the doses used, the cationic poly-amino acid pR exerted significant immunostimulatory, but no toxic effects. Further advantages include the ease of vaccine preparation, the possibility to incorporate multiple Ags into the vaccine, and the simplicity of combining cationic poly-amino acids with immunomodulatory agents. Together, these features render cationic poly-amino acids attractive immunological adjuvants. We thank Irmina Gorny and Wolfgang Zauner for peptide synthesis, Elisabeth Kowalsky and Frieder Koszik for help with statistical analysis, and Martina Hammer and Erich Berger for excellent animal care. ↵1 This work was supported by a grant of the Austrian Federal Reserve Bank to A.S. (no. 8264). ↵3 Abbreviations used in this paper: DC, dendritic cell; pR, poly-l-arginine; pR-PV, pR-based protein vaccine; pDNA, plasmid DNA; i-site, injection site; β-gal, β-galactosidase; i.d., intradermal; RT, room temperature; TAA, tumor-associated Ag. Schneeberger, A., F. Koszik, G. Stingl. 1995. Immunologic host defense in melanoma: delineation of effector mechanisms involved and of strategies for the augmentation of their efficacy. J. Invest. Dermatol. 105: 110.S.